"Alpha Software delivered under tight time and budget pressures, and the final app exceeded our expectations and is delighting our clients." Northern Edge Physical Therapy in Alaska had an urgent need. The firm was holding a grand opening for its new office location and wanted to introduce a new patient care app simultaneously. 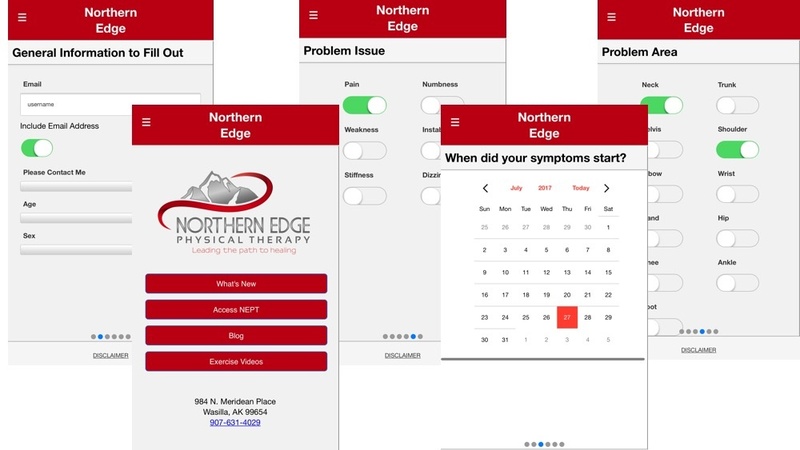 Northern Edge Physical Therapy wanted to use a mobile app to increase information flow and customer service for its patients, and differentiate itself in the market in terms of customer service and modern technology usage. The firm believed that a well-built mobile app could help gain office efficiencies and improve communication with patients. The team at Northern Edge had attempted to build the app themselves, but had hit a wall and needed help fast - the grand opening day was just a few weeks away. After evaluating other rapid app development platforms and service organizations, founder of Northern Edge Physical Therapy, selected Alpha Software and the Alpha Anywhere platform as it promised to build business apps fast and affordably. One call to Alpha Software and the Alpha Professional Services team was up and working on a solution for Northern Edge Physical Therapy. Alpha Software helped Northern Edge Physical Therapy gain proficiency at mobile app development. The Alpha Professional Services team worked within Northern Edge Physical Therapy's budget, and did not charge rush fees, despite the accelerated timeline. The Alpha team met Northern Edge's deadline, including testing and refinement of the app. The morning of the office grand opening, patients were downloading the new Northern Edge Physical Therapy patient care app from the Google Play and Apple App Stores and interacting with the app. The app was completed in 80 hours of development time and the finished deliverable was in Northern Edge Therapy's hands in 4 weeks. "When you need a critical app built, that doesn't cost a fortune and on a platform that you can become proficient on quickly, then make your bet on Alpha Software." The patient care app, built with Alpha Anywhere, allows doctors to talk to patients so they can ask questions, send out news and therapy updates or videos. In turn, patients can use the app to ask and get fast answers to their questions, and they'll be sent an alert if an appointment slot frees up. Patients feel that customer service and respect of their time has greatly improved, while the organization is managing resources much better and insuring that open appointments are filled so the pipeline is always full and time not wasted, or patients frustrated that they can't get in to see a therapist. "Alpha Software delivered under tight time and budget pressures, and the final app exceeded our expectations and is delighting our clients," said Keith Poorbaugh, founder of Northern Edge Physical Therapy. "When you need a critical app built, that doesn't cost a fortune and on a platform that you can become proficient on quickly, then make your bet on Alpha Software."